Genome Sequencing: What’s the Cost for Knowing Clues to Baby’s Future? Baby’s keepsakes: Tiny footprint, lock of hair, and a DNA sequence? As human genome sequencing grows faster and cheaper, how much should parents learn about their babies’ genetic blueprints? In this recent NPR report, bioethicists and other researchers weigh in on what might happen if whole genome sequencing becomes commonplace. There’s plenty of evidence that parents already often overreact to the relatively small amount of data that they’re getting from little spots of blood collected at birth. Bioethicist Mark Rothstein of the University of Louisville says the tests can lead to so-called vulnerable child syndrome. 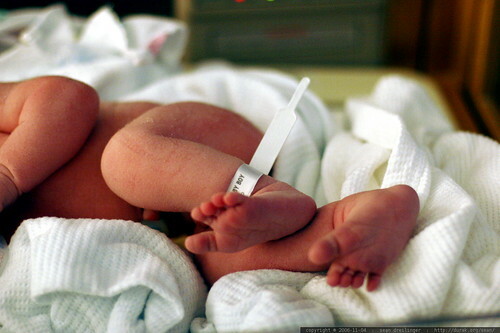 via Genome Sequencing For Babies Brings Knowledge And Conflicts : Shots – Health News : NPR. This entry was posted in Genetics, whole genome sequencing and tagged babies, DNA, genetic testing, genetics, research, science, whole genome sequencing by Susan Frith. Bookmark the permalink. Thanks for reading my blog! Yes, it’s a relief for me to know that I can link to good sources when I’m not as familiar with a particular topic as I’d like to be!